Yesterday at Leamington saw some incredibly tight finishes in the final stages of the Friends Two Wood Pairs competition. Played over 15 ends and with a one bowl shoot out if scores are level at the end no one could have envisaged that both semi-finals would end in shoot outs. In the first semi John Colley and David Holloway of Herefordshire led early on only for Kay Harvord and Sue Moodey of Hertfordshire to take a 9-6 lead at 10 ends. The lead continued to fluctuate but with the scores tied 11-11 at 15 ends it was the Herefordshire team that emerged victorious on the extra end. The second semi-final was more one sided and when Max Richards of Cornwall and Bowls England President Michael Jennings scored a maximum 4 on the 11th end to lead 12-3 the game looked all over. 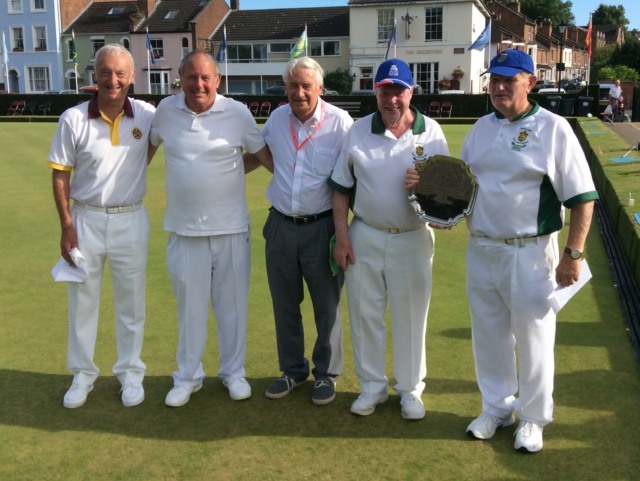 Their opponents Ken Eichen and Spencer Kerley of Hampshire then picked up two singles and a three and amazingly a last end four to take the game to an extra end which they won. The Final could never live up to the semi-finals but it did. Hampshire established an early lead only to be pegged back by 10 ends. The scores then fluctuated and the teams were level 11-11 at 13 end. On the penultimate end Spencer Kerley drew shot with his last bowl to give Hampshire a one shot lead going into the last end. It then looked as if the game would go Hampshire’s way as they held two shots as David Holloway stood on the mat to deliver his last bowl. He produced the perfect shot and took us into yet another shoot out. Winning the toss for choice of jack Herefordshire elected to bowl first – a decision that was vindicated when neither Hampshire player was able to beat John Colley’s first bowl. Presenting the awards after the game, the Chair of the Friends Geoff Hunt congratulated all competitors on the standard of bowling throughout the day and particularly complimented the finalists on the enthusiasm and stamina they had shown in playing 77 ends in one day in what were very hot conditions. Finally, he congratulated Kay Kerley on her hard work in running so smoothly a competition that is now looked forward to by so many Friends.